It has been an interesting 1-2weeks where almost everyone on the street talked about the $13.9m (USD$9.9m) toto grand prize. Most of my colleagues and friends asked if I have bought the ‘ticket to financial freedom’. As an options trader/statistician, I didn’t and to the surprise of many, I have never purchased lottery/toto before. The result released on Friday and we have 3 big winners! 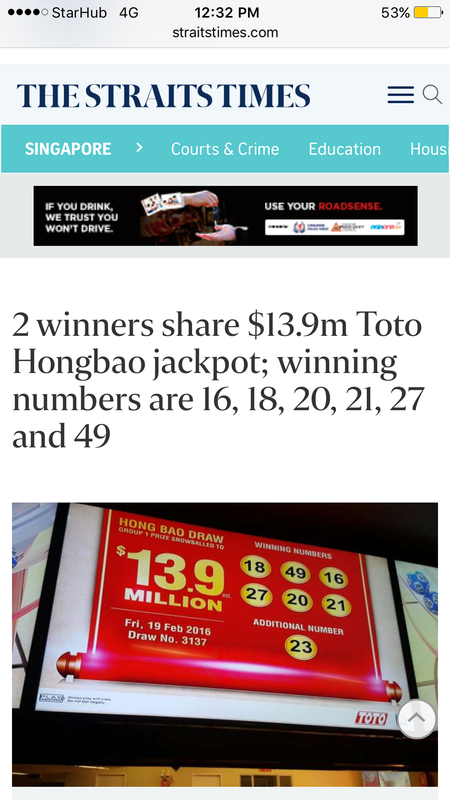 2 winners shared the $13.9m while the biggest winner, Singapore Pool happily took all the bets from the table. If I put this context to the options trading, Singapore Pool is the options seller and the public who purchased the lottery tickets are the options buyer. The public paid a small amount of bet (premium) to take an extremely small chance of winning (low probability of success) in the hope of getting the million dollar prize (unlimited profit potential). The analogy is just another way of illustrating options trading from different angle. You may have the impression that the options seller will always profit base on this example but in real options trading this may not be the case, there are a lot of intricacies that we need to consider. Anyway, it is Chinese New Year! At time we may not need to be too sensible, so just relax and enjoy!